Professor Ceiling Cat is BACK! Many thanks to Grania for doing the Hili dialogues (and the Gillette ad post) in my absence. Thanks as well to all the readers who said nice things on my tenth-anniversary post, and to those who sent me Coynezaa presents, which I didn’t expect. One person sent me a passel of Cadbury Crunchie bars from the UK, which are terrific and I don’t know who that is. Please email me so I can thank you properly! Ditto for CM who sent me a lovely cat book, but whose address I don’t have. It’s wicked cold in Chicago, with the ambient temperature 8º F (-13º C), and -1º F (-18ºC) with the wind. And there was more snow. Today is Monday, January 21, 2019, and National Clam Chowder Day, which to me means New England style rather than the debased, tomato-based concoction called “Manhattan Clam Chowder”. It’s also National Hugging Day, invented in 1986. If you’ve hugged someone, weigh in below. It’s Martin Luther King, Jr. Day in the U.S. celebrating the birthday of the civil rights leader. He was actually born on January 15 (1929), but Ronald Reagan proclaimed the holiday to be on the third Monday in January. It’s a federal holiday, meaning that there’s no mail and that banks as well as most Federal offices are closed. Here’s today’s Google Doodle honoring King, who was assassinated in 1968 at the age of only 39. It was a rather thin day in history. On January 21, 1789, according to Wikipedia, “The first American novel, The Power of Sympathy or the Triumph of Nature Founded in Truth by William Hill Brown, is printed in Boston.” I have never read it; has anyone? Exactly four years later, after being convicted of treason, Louis XVI, King of France, was executed by the guillotine. Speaking of firsts (and lasts) in transportation, there were two more innovations on this day that went bust. In 1976, the first commercial flight on the Concorde began with routes from London to Bahrain and also from Paris to Rio. The plane flies no more. 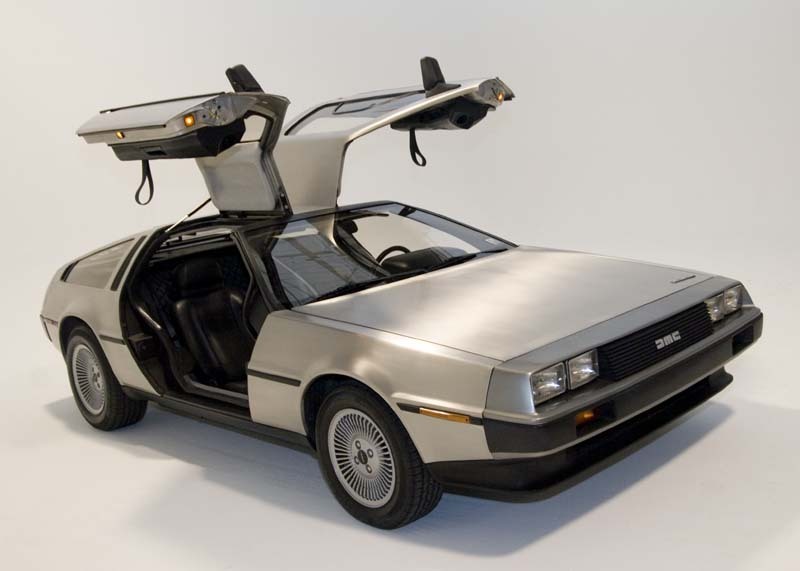 And exactly five years later, production of the Delorean DMC-12 sports car began in Northern Ireland. They stopped making them 2 years later. It was distinctive with its gull-wing doors, and here’s a model from its last year. They’re probably worth a fortune now. Those who died on January 21 include Vladimir Lenin (1924), Lytton Strachey (1932), George Orwell (1950), Cecil B. DeMille (1959), James Beard (1985), Susan Strasberg (1999), and Peggy Lee (2002). A: What would you like to get? 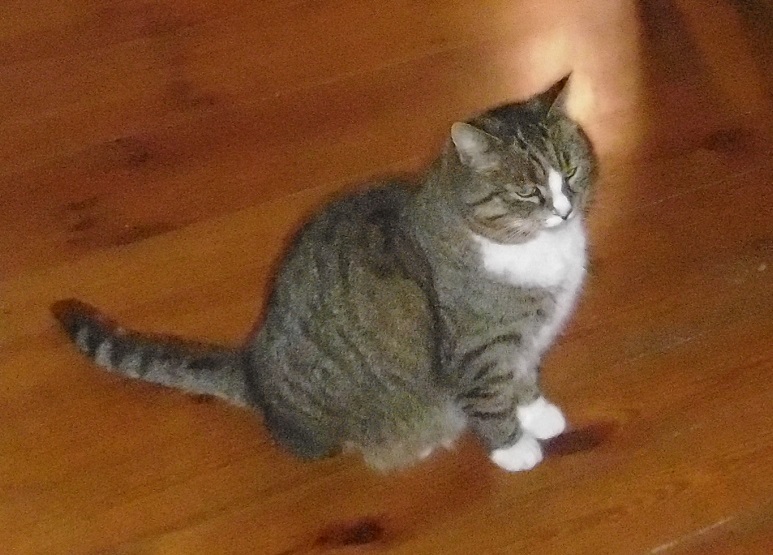 Hili: A star from the sky. Leon’s still hiking with his staff in southern Poland, and sends us the dialogue below. 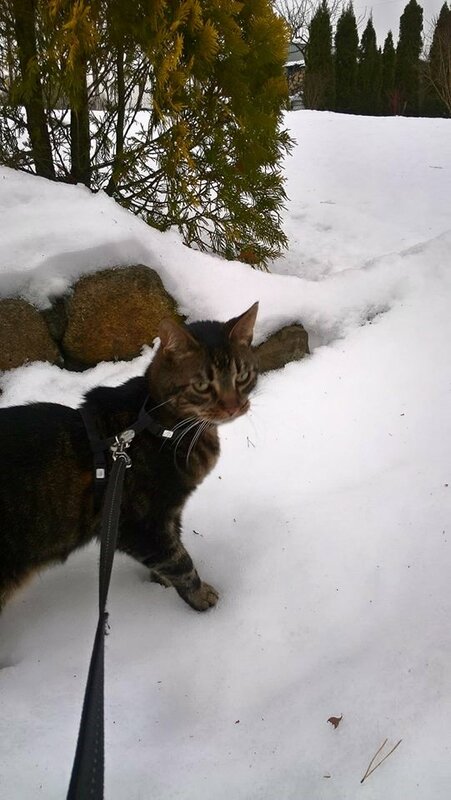 Somehow I think he’s not as happy with the snow as he was in previous years. Leon: I think I’m more comfortable with the fluff in my pillow. In Polish: Chyba jednak bardziej mi odpowiada puch w poduszce. 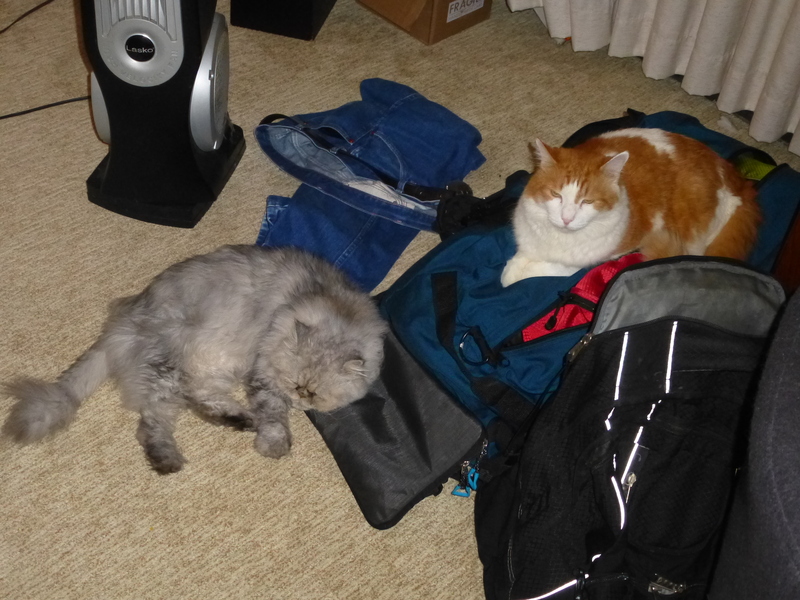 Pi and Loki on my last day in Hawaii, imploring me not to leave by sleeping on my luggage. I miss these boys. This entry was written by whyevolutionistrue and posted on January 21, 2019 at 7:15 am and filed under Hili Dialogue, Leon monologue. Bookmark the permalink. Follow any comments here with the RSS feed for this post. Both comments and trackbacks are currently closed. I thought all Federal offices are closed anyway due to Trump?! No, not all federal offices are closed. There are some federal employees forced to work without pay as they are deemed “essential” (whatever that means) and some departments/offices had spending authorizations passed before everything stalled so they remain open as they are funded for at least a while. Then there are some like Nancy Pelosi who are still collecting on her $235,500/year salary as Speaker of the House that have nothing to lose in prolonging the financial agony of the common federal employee simply because she hates Pres. Trump. Go figure. It’s called not negotiating with terrorists. Pelosi’s House has passed legislation to open the government — legislation that was previously passed by the Senate unanimously. Responsibility for the shutdown rests squarely with Trump (who publicly took credit for it) and McConnell (who won’t bring the House legislation for a vote because he knows it would pass). Thank you for that. Cannot believe anyone but a Trumper could think otherwise. Where is the free will to think? How is it that McConnell has the power to stop the legislation from coming before the House for a vote? Sorry but I don’t understand the rules. I agree that giving in to Mr. Trump would open the floodgates to more such temper tantrums. The Senate majority leader has control of which bills are brought for a vote. By the way, the Senate, like the Electoral College, is a fundamentally undemocratic institution and should be done away with, but good luck with that. Thank you. So McConnell stops it coming for a vote in the Senate, not the House. That makes sense. I agree about the Electoral College and the Senate, but as you say they are likely here to stay. The Democrat House of Representatives has already passed a bill to reopen the government. I’m not sure what else Pelosi can do. One thing she certainly can’t do is give in to Trump’s demand for money for his useless wall. If she did that, he’d be closing the government every time sane voices said no to him. Pelosi is independently wealthy. She doesn’t need the salary. She’s got nothing to lose but respect, and she’s got quite a lot of that as well. Nothing like cats to get through the day. Leon is right, the older you get the less attractive is the snow. And it isn’t a mystery. The same t-shirt that responds to the “magnets, how the (&*)( do they work?” applies! I knew somebody would beat me with a reference to “F*cking Magnets, How Do They Work?”. The Insane Clown Posse will never be heard at BJU. Deloreana aren’t with as much as you might think — around $30-50K. They were terrible cars. Now if they have the optional flux capacitor it’s a different story. They looked like a supercar, went like a taxi. And reputedly the build quality was poor. Probably half their market price now is thanks to ‘Back to the Future’. If their performance matched their looks they’d be double the price. I know how that squirrel feels whenever I am at a Chinese or Indian buffet. I hope you enjoy the book. When I read it last year you immediately came to mind as someone who might enjoy it. C. W. Gusewelle was one of my favorites. I miss his Sunday columns. He did a few things for our local PBS station, KCPT, that are worth a watch and are probable easily found online. I don’t know how well known he is outside of the reach of the Kc Star but I think he deserved a wider audience. The most famous car (in my view) due to “Back to the Future”. If you do decide to buy one, make sure that it has a working hover conversion AND a Mr Fusion – those flux capacitors are real power hogs and you can’t always rely on a lightnening strike or plutonium supplies. I still think that 1.21 JiggaWatts is the energy dissipated in a performance of Riverdance. I don’t know where that came from… my brain definitely said lightning. He [MLK] was actually born on January 15 (1929), but Ronald Reagan proclaimed the holiday to be on the third Monday in January. The Gipper was never much one for details (or the civil-rights struggle) anyhow. I’m thinkin’ maybe that was ’52, since it looks like warm weather, and Ike was inaugurated in January 1953. I’ve certainly felt it a few times. Don’t particularly want to feel it ever again, either. “We can … feel only what electricity does“. Errm, doesn’t that apply to anything we feel? I had forgotten that today was a federal holiday. Now I am wondering why a USPS truck drove up to the house a short time ago and delivered a package. The only thing seagulls care about is deliberately disobeying signs. You would have thought that the congregation would carry cash specifically and wouldn’t need contactless payments. Could just be that they want to get them giving more to compensate for the lack of punters. SumUp’s co-founder Marc-Alexander Christ said it was “an amazing example of tradition meeting technology”. Or the seagull is a Welsh speaker on a day trip.